Been diving in Indonesia? Please Vote! Indonesia is certainly the land of plenty when it comes to fish. Offering a greater variety in fish species than both the Great Barrier Reef and the Red Sea combined; it’s no wonder why it is rated as one of the best scuba diving destinations in the world. With over 3000 fish species as diverse as they are plentiful and at least an impressive 500 species of coral, divers are guaranteed a truly magnificent experience in Indonesia. Ever heard of the mysterious Mola Mola? Otherwise known as the Oceanic Sunfish, this 1000kg wonder can be spotted in the rich and temperate waters of Bali. Divers are often spoilt for choice with regular sightings of magnificent Manta Rays, Reef Sharks and large schools of pelagics, not to mention world class macro-life. As if you needed any more convincing, Indonesia is also home to the undisputed best muck diving spot in the world, Lembeh strait in North Sulawesi. 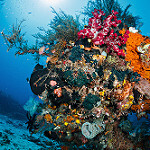 Indonesia offers enormous flexibility, with popular dive sites just about everywhere! This video will give you a ‘short and sweet’ view of what you’ve been missing out on. If you’re into more than just diving, why not take a trip to Komodo National Park and encounter the exotic Komodo dragons, or spend some time soaking up the sun on the many sandy beaches? 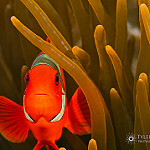 For underwater photography enthusiasts, the unspoilt coral varieties will not fail to disappoint. Although some reefs may reflect damage from bomb and cyanide fishing, the majority of areas in Bunaken, Sumatra, Raja Ampat and many other places offer pure and untouched underwater beauty. For those just starting out, Indonesia is the ideal location to learn to scuba dive without breaking the bank. Areas such as Lombok and the Gili Islands offer ideal conditions for beginners. Explore below more details about scuba diving in Indonesia. 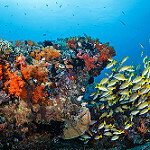 Those who call Indonesia ‘macro diving paradise’ certainly have an overwhelming amount of evidence to prove their case. Divers have the opportunity to spot all sorts of rare and diverse creatures such as the ghost pipefish, the mimic octopus and the cuttlefish. Lembeh in North Sulawesi is world famous for macro underwater photography, as is the newly popular Raja Ampat which offers the richest marine biodiversity on Earth. Muck divers have also been known to frequent sites such as Secret Bay and Seraya Secret in the North of Bali to spot the weird and wonderful including nudibranchs and other rare critters. Wreck diving is plentiful in Indonesia with the most famous wreck, the US Liberty Ship, found in Tulamben on the North East of Bali’s incredible coastline. The province of Papua even offers the chance to discover several World War II shipwrecks and planes. Now that you are excited to see the wonders of Indonesia for yourself, you need to decide on when to visit. 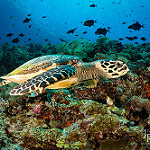 The good news is that diving in Indonesia is possible throughout the year, however many would agree that diving during the dry season is best. It’s best to check specific details for the different areas as weather does vary greatly across this large and mystifying land. Liveaboard diving holidays are available all year round. In general, the dry season is from April to October and the rainy season is from November to March, however in the Maluku islands (Moluccas) these seasons are reversed. There is certainly something to be said for visiting during Indonesia’s rainy season, especially as this is the best time to spot Manta Rays around the Komodo islands. Bali is also a decent destination during the rainy months as it experiences its own weather patterns and is less affected by the monsoons. As always, diving conditions tend to vary from place to place and differ between the seasons, but divers can expect average water temperatures of 26°C to 30°C and air temperatures between 25°C and 35 °C. Visibility is generally in the range of 10-60m and currents can vary from non-existent to very strong depending on the location and tide. 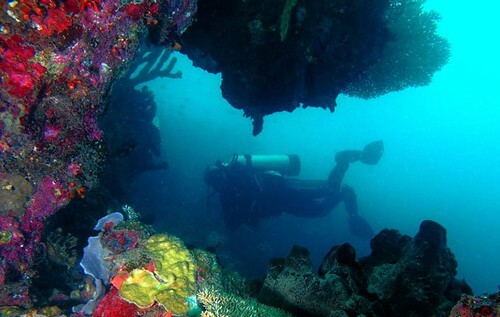 Dive centres are plentiful in the popular tourist areas of Indonesia, making it easy to organize a dive. Note that the safety standards of some dive centres may differ from what you are used to, so it’s always best to select carefully. Those in-the-know choose to explore the many pristine diving spots in areas such as Raja Ampat by liveaboard. The abundance of dive sites in Indonesia makes it mandatory for divers to make clear choices about where they want to dive and how long they want to dive. 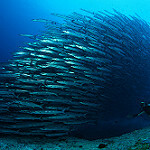 Diving safaris are designed for specific periods or to cover specific dive sites. There are distinct cruises for Komodo Island, Sulawesi, Banda Islands, Raja Ampat etc, and each of these will traverse only that particular area or a pre-fixed combination of places. For example, there is a package that allows the customer to dive through most of Raja Ampat. Likewise, a cruise may be only for a few days or for an entire fortnight. Among the many diving destinations, the Komodo Island National Marine Park tops the list in popularity. The waterways frilling these islands are rich in planktons on which large pelagics like manta rays and whale sharks feed. Besides, there are plenty of filter feeders on the walls. Colourful critters like sea apples, crinoids, tunicates, and sea squirts splash the sea with brilliant colours. Muck divers’ friends like pygmy seahorses and frogfishes are also abundant in the sheltered bays. A cruise to Komodo can be a short one of 7 nights or a long one of 11 nights or anything in between. An 11 night cruise will be ideal for exploring the place fully. However, shorter cruises and budget cruises cater to the needs of those who do not have the time or financial resources for longer trips. Cannibal Rock and GPS Point are included in most cruises to Komodo, plus there is mostly a land visit to see the giant lizard with forked tongue called Komodo dragon. Long cruises will include visits to Maumere Bay which is a part of Alor and Flores. Veteran divers have always loved the West Papua liveaboards that take them to Raja Ampat, a place so rich in marine life that one could never tire of watching the creatures’ incredible varieties and cute antics. 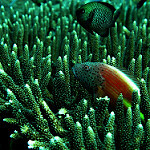 The area is home to the largest number of corals and fishes anywhere in the world. It is a macro diver’s cornucopia. While exploring Raja Ampat fully is in itself no easy job, many people want to add visits to Cenderawasih Bay and Triton Bay to a Raja Ampat itinerary. Whale sharks and Second World War wreckages are some of the attractions in these bays. Until they actually perceive it, divers can barely imagine the incredible wealth that the sea hides in places like Ambon and Banda Islands. Earlier the Banda Sea did not have much significance compared to other diving sites in Indonesia but it has now been accepted as an outstanding liveaboard area. Besides the abundance of small critters, Ambon has flourishing reefs, shoals of multicoloured fishes, and plenty of big pelagics. And you will get a lot of entertainment from dog-toothed tuna, large schools of mobula rays, and sharks engaged in various activities. A 14 night cruise that includes Banda is quite common and gives the divers the necessary time to explore the area fully. However, there are cruises of lesser duration, including short ones of just 7 nights. Experienced divers prefer longer liveaboard cruises that provide good quality boats as well. The northern parts of Sulawesi that include Lembeh and Bunaken, as well as its southern Wakatobi region are well-served by liveaboards. Liveaboards in the area of Bunaken Island, Sangihe Archipelago, Bangka, and Lembeh Strait are ideal for divers in search of rare and bizarre specimens. Lembeh is especially rich in interesting creatures like mimic octopus, spiny devilfish, stargazers, snake eels, mandarin fish, hairy frogfish, and pegasus. Each and every one of these is a photographer’s delight. Though the number of liveaboards to North Sulawesi is limited, those that exist are good ones that go across many fine diving sites. There are budget cruises as well as luxury cruises, catering to the needs of all income groups. There are lengthy cruises of up to 11 nights and shorter ones of 7 nights or more. Wakatobi Archipelago is included in most luxury cruises, even in those of short durations. The safari covers the exquisite reefs of the area and the outer pristine atolls unspoiled by man. Feeling inspired and raring to go? Check out our Indonesia travel guide and start planning your next diving trip! 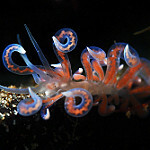 Lembeh Strait is probably the world’s best muck diving destination for underwater macro photographers! Derawan island is famous for turtles and a paradise located in Borneo’s East Kalimantan. Diving in North Sulawesi is an absolute must! Saya mau nanya mengenai open water diving course untuk beginner. Apa ada jadwal yang available untuk akhir September/awal October? Teman saya tertarik untuk terbang ke Jakarta, tetapi jadwalnya short di Jakarta. Apa (5-6 hari consecutive days) cukup untuk ambil program dasar certificationnya? I have 2 faulty oceanic GEO2 computers, looks like pressure sensor is broken, can someone repair them? I am living on pulau weh, Sumatra. I am looking to buy the Hollis SMS 75. do you can order it? Do you sent diving gear in indonesia? I am available in the weekend Oct 28-29, and would like to dive in Pulau Seribu near Jakarta. I have PADI OW certificate, 8 bottles experience. 1. Is there a 2-day AOW course available? 2. What is the schedule and arrangement? 3. Which islands are you going? 4. What is the price of the course? I am planning to do a liveaboard at Raja Ampat in the coming December. Could you kindly tell me the plans / rates / days that you can offer, and what dive sites are included? We’re interested in your Dances and Dragons cruise on June 17, but would like the chance to SCUBA 3 times while we’re in Indonesia. Does the Ombak Putih offer SCUBA or just snorkeling? I want to buy some snorkelling gear, can you tell me your address in Jakarta? hi, we are going to sorong for snorkel trip with Oceanic Society in November and need snorkel equipment but do not want to pack it from US. can we get equipment at Planet Diving?? how far is the dive center from FM7 hotel near airport? Planet diving atau javascuba authorised repairer nya oceanic ya di indonesia? Bisa service oceanic zeta? Can i get a service for my Oceanic BCD? Do you have space on a live aboard for two people sharing in Raja Ampat departing on 2 February 2019?